Chevrolet announces it's most powerful engine ever offered in a regular production. Click here for details! Gandrud Automotive Group is a full service car dealership with several locations in the Green Bay, WI area. �Gandrud is locally owned and offers a relaxed new or used car shopping experience with a friendly, no pressure sales team. Gandrud does not sell manufacturer buybacks or lemons. Find out what actual customers are saying about Gandrud. Gandrud goes the extra mile to exceed the customer's expectation and you can read about real people's experience to find out what makes Gandrud the best. Read testimonials now. In addition Gandrud has the "One Low Price Plain and Simple... Always" philosophy meaning that every vehicle on our lot has our "Best Price" clearly hanging in the window. Vehicle trade appraisals are calculated at the "actual cash value" and that is the amount we will write you a check for. Gandrud does not have any hidden fees and offers affordable financial solutions for today and for your future. Gandrud offers competitive financial options for all customers. Fill out a secure credit application online and learn about Gandrud's extended warranty policies. Click here for the business credit application. Gandrud recently opened its newest addition, the Nissan dealership near Green Bay's East Town Mall. It has the distinction of being Wisconsin's largest Nissan dealership with a 42,550 square foot facility including a 10 bay service department and 1,759 square foot parts department. The Nissan dealership has earned the honor of Nissan's "Owner First Award of Excellence" for outstanding customer service. Visit Gandrud Nissan's website. Gandrud has Nissan commercial vehicles, the new NV commercial van as well as Titan and Frontier trucks. Visit Gandrud Nissan's commercial vehicle website for more information. Gandrud's Chevrolet dealership is Northern Wisconsin's Number 1 Chevrolet dealership. People from Appleton, Upper Michigan, Door County, Pulaski, Abrams, and Wausau make the trip to Green Bay because Gandrud Chevrolet has the best in selection, price, reputation, and customer service. Visit Gandrud Chevrolet's website. Gandrud's Dodge, Ram, Chrysler, Jeep dealership is located directly across the street from Gandrud Chevrolet. The dealership keeps a complete inventory of Dodge, Ram, Chrysler, and Jeep cars, trucks, and SUVs in stock. Stop by the Dodge, Ram, Chrysler, Jeep store and you won't be left unsatisfied, customer satisfaction is Gandrud's number one goal. Visit the Dodge, Ram, Chrysler Jeep website. Gandrud on Green Bay's West Mason and Oneida sells high quality used cars. Stop by the dealership to see the selection of certified used cars, imports, and American made cars, trucks, vans, and SUVs. Visit the Gandrud West Value Center website. Gandrud has a great selection of factory pre-owned certified vehicles in addition to new cars, trucks, vans, and SUVs. Choose from our selection of Chevrolet, Buick, Pontiac, GMC, Dodge, Ram, Chrysler, Jeep, Nissan and Cadillac pre-owned certified cars. Put your mind at ease with the warranties and assurances of a certified used car. Visit our used car website to view all pre-owned cars and certified cars. 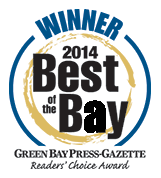 Gandrud has 25 years of quality auto repair service history in the Green Bay area communities. Gandrud's auto repair service center services all vehicle makes and models and can help with preventative maintenance to save you money down the road. Visit our auto repair and service website for more information. Gandrud believes in giving back to the community and has a history of Green Bay community sponsorships, and donations to prove it. Read about some of the recent programs about Gandrud and the community. Learn about current openings and apply online.